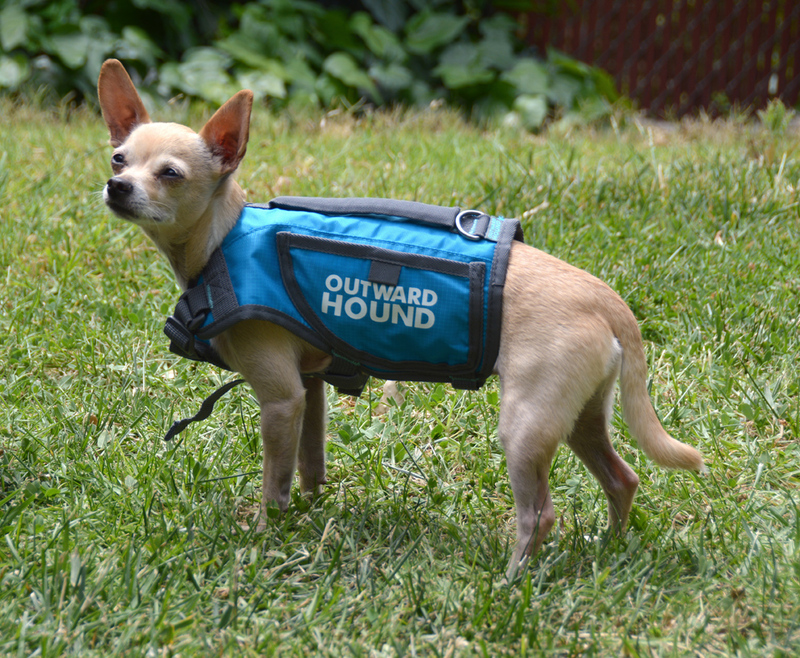 One of Outward Hound's product line from this past winter, the Thermovest is part harness, part toasty warmth. This is more than just insulation, the vest actually reflects heat like a space blanket, thanks to its reflective interior lining. Currently on clearance, the Thermovest is available in five sizes to fit dogs with chests up to 41" around. This is a weird product. It's shaped a lot like a Ruffwear Webmaster harness, but the inside is all shiny. There's a handle on the top, and little pockets on the side. Very little pockets, in the case of our extra small vest. I could maybe fit one poo bag in there. The sizing seems a bit off, this one is described as fitting dogs 5-15 pounds, but it is definitely too big and long for 6.5 pound Ru. Also the rear strap covers his junk. It's a fairly supportive harness, it just doesn't adjust down far enough for a super tiny dog. Sorry Outward Hound, but my experience with dog gear has led me to associate your brand with cheap stuff. The Thermovest is no exception, the straps feel flimsy and the adjustments feel loose. I'm not sure I would trust this thing to stay on an actual dog-sized dog without loosening up enough to allow escape. The design should be escape-proof in theory, but in practice I wouldn't trust this at all. Apparently it is also prone to coming unstitched around the leash if your dog pulls a lot, so I would really classify this as clothing no matter how much it looks like a sturdy and secure dog harness. Does it work? My Reynaud's-suffering friend (who is also my dog-treat-tasting enabler) said it did make her body feel warmer wherever she touched it. It's sort of a slow warmth though, it just reflects your own heat back. I wore it on my head for a while and it did eventually warm up, so I believe the actual technology to be sound. Pros: Provides warmth without restricting movement. Very adjustable, fits a wide range of dogs at every size. Convenient handle for lifting bitty dogs. Supportive design includes rear strap that sits behind ribcage. Cons: Quality is lacking, as is durability. May fall apart with regular use. Sizes run large. Bottom Line: I bought this for $9 at Ross to see if it would work for Ru, but he doesn't produce a ton of body heat on his own and it's too big anyway. I'm interested to see what Outward Hound rolls out with this coming winter.